As the cosmos shudder and fans applaud, the Houses of Atreides, Ordos, and Harkonnen continue their epic struggle. Only now, they compete for control of the universe on the Sega Genesis. This fast-moving, exciting, adrenaline flowing strategy game is not just some fast-moving, exciting, get-the- adrenaline-flowing strategy game! It's building, harvesting, tactics, exotic locale, and the palm-sweating edge of combat! Dune: The Battle for Arrakis features nine levels of furious real-time combat, made more intense by extensive digitized voices and sounds spanning from the blast of rockets to a soldier's dying screams. 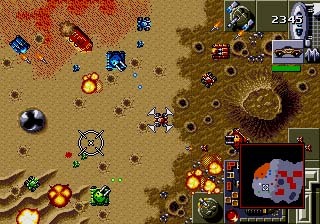 Dune II enthusasts will be glad to know that the new Dune: The Battle for Arrakis on the Sega Genesis keeps all of the strategy, action and excitement of the original. The game moves along at a breakneck pace with a re-engineered game interface, bigger and brighter graphics, and all-new musical scores. 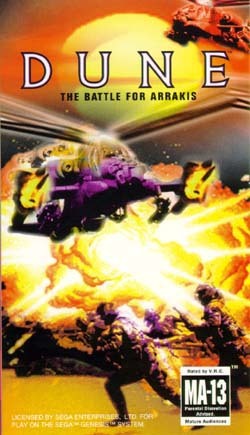 Players who like fast, fluid high-intensity competition will love Dune: The Battle for Arrakis. 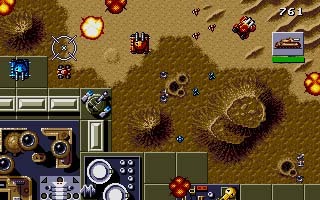 Players familiar with Dune II for the PC will recognize Westwood's easy access interface. Additionally, a tutorial feature has been added to aid neophyte field combatants in learning the many play mechanics and variations. However, don't think this game for the timid or casual player. The screams of the infantry and the horrors of the Sand worms may be disturbingly real, but as commander, it is still your duty to lead your chosen House to victory and complete the conquest of Arrakis. Be warned: the odds are against you. Cunning tactics and decisive action are all that can keep you from becoming just another red spot in the sand. © 1995, 1996 Westwood Studios - All Rights Reserved.